Stocks jumped on Tuesday after Congress announced there was a deal in place that would avoid another government shutdown. The indices gapped higher and continued to move higher throughout the day. The gains were pretty even across the board, but the Dow led the way with a gain of 1.49%. The Nasdaq notched a gain of 1.46% while the S&P tacked on 1.29%. The Russell added 1.27%, but that was the smallest gain of the four. All 10 sectors moved up on the day, but the materials sector had the best gain at 2.24%. Industrials experienced the second best gain at 1.55% and it was followed closely by the consumer discretionary sector with a gain of 1.54%. There were eight sectors that finished with gains over one percent. The only two sectors that didn’t gain over one percent were utilities (0.23%) and consumer staples (0.78%). My scans came in with a positive reading last night and that ended a streak of 23 straight days of negative readings. There were 51 names on the bullish list and 19 names on the bearish side. The barometer jumped sharply to a reading of -6.8 from -45.5. Today’s trade idea is a bullish one on Amgen (Nasdaq: AMGN). The biotech company scores an 82 on the EPS rating and an A in the SMR category. The company sports a return on equity of 50.7% and a profit margin of 49.4%. Like we saw with CME Group the day before, the bullish signal on Amgen came from daily indicators, but it was the weekly chart that got my attention. 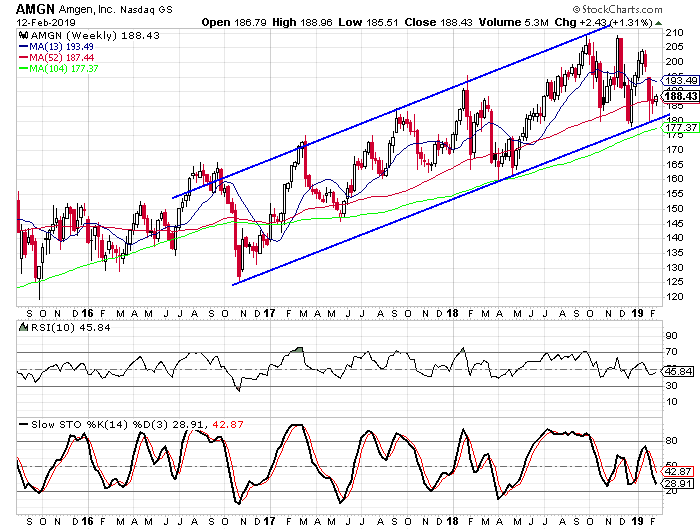 We see how the stock has trended higher over the last few years and a trend channel has formed. The stock just bounced off of the lower rail of the channel. Buy to open the April $185-strike calls on AMGN at $8.50 or better. These options expire on April 18. The options will double if the stock reaches $202. To hit that price, the stock won’t have to break through its recent high. I suggest a target gain of 100% with a stop at $183. A new earth-shattering government announcement could completely change the legalization of marijuana – forever. In fact, thanks to this historic legislation, tiny pot stocks trading for under $5 are getting set to double, triple, or quadruple. In an exclusive interview, pot stock expert Michael Robinson shares all the good news – including details on five tiny weed stocks that could potentially turn a small stake into $100,000. Click here to continue..